Also, the C8 Preliator is now only available with a manual. We knew Dutch automaker Spyker was bringing , which it showed off last year, to the 2017 Geneva Motor Show. What we didn’t know is that powering the C8 Preliator Spyder would be a Koenigsegg-sourced naturally aspirated 5.0-liter V8 engine. The Dutch have joined forces with the Swedes and the result is an avant garde convertible making 600 hp and 442 lb-ft of torque. That’s a substantial bump in power from the previous engine used in the C8 Preliator (the coupe and Spyder will both use Koenigsegg engines). The engine previously announced for the C8 Preliator was . The move to a more powerful engine means better performance times, although we only know the figures for the Spyder at the moment. (The hardtop model will obviously see a boost in performance as well thanks to the new engine.) Its 0-62 mph time is rated a 3.6 seconds, up a tenth of a second on the Audi-powered C8 Preliator coupe. Top speed is up ever so slightly, going from 200 mph in the hardtop to 201 mph in the convertible. In addition to switching up its engine supplier, Spyker is also changing course on its transmission options. The automatic transmission is out. A six-speed manual will be the only option. Spyker says it made the switch after gathering customer feedback. Other than the switch in engine and the ditching of the automatic transmission, admittedly big changes, the C8 Preliator Spyder is identical to the hardtop that preceded it. That means the body is carbon fiber and the hood is aluminum, as is the tonneau cover for the automatic folding soft top. Handling should match the engine’s performance as Spyker sources the C8 Preliator’s chassis from Lotus. The cabin is a mix of leather and brushed aluminum. It's sort of a luxury steampunk look. No touchscreen is available because the C8 Preliator Spyder features a heads-up display which utilizes gesture control. We aren’t sure how safe this is—being forced to wave your hands around at speed sounds dangerous to us—but it’s a novel idea nonetheless. 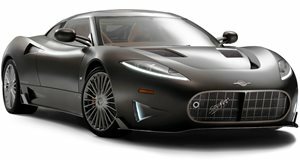 Spyker is planning on building 50 C8 Preliator coupes and 100 C8 Preliator Spyders. Production of the hardtop is expected to begin towards the end of 2017. The Spyder will commence production in the second or third quarter of 2018. Both cars will be built at the automaker’s facility in Coventry, England. Much like the C8 Preliator coupe the Spyder with a price tag of $429,000.